Thought the HSE says mileage isn’t everything, paramedics are worried about the state of the vehicles they drive every day. 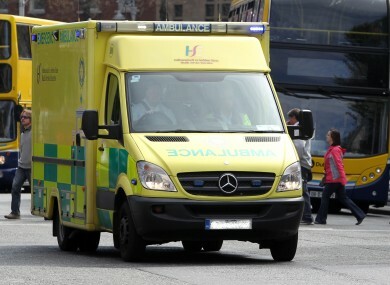 THE HSE HAS revealed that it does not have a mileage limit for taking its ambulance vehicles out of service. It is routine practice with An Garda Síochána to retire patrol cars out of the fleet once they reach the mileage limit of 300,000 km. Recent figures have shown there are at least 48 vehicles within the HSE ambulance fleet that are over 400,000 km and 71 that have done more than 300,000km during their service. The HSE revealed to TheJournal.ie this week that a limit, similar to that for An Garda Síochána, does not exist for taking ambulances out of the fleet. Instead, various parts of the vehicles are replaced as they break or age. In a statement it said all 522 of its National Ambulance Service vehicles are serviced and maintained in line with the vehicles manufacturers guidelines. The registration plate or the odometer reading on any vehicle does not always reflect the age of the engine, as part of the maintenance of vehicles engines or other parts may be fully replaced therefore extending the life of a vehicle. While the HSE stresses that the odometer reading in an ambulance is not everything as it does not reflect an engine replacement, attention has been drawn to a series of high profile breakdowns this year that happened either on the way to serious incidents or with patients inside. In July, an ambulance transferring a life support patient lost power en route to a hospital in Dublin. This happened just ten days after another caught fire and the crew and their patient were forced to flee the vehicle. Generally, it’s not a good idea to keep changing parts. If you’re just changing the parts, it’s like having your organs transplanted all the time. The parts might work, but your bones would still deteriorate. One NAS paramedic said he was “extremely worried” about the current state of the vehicles that he and his colleagues are driving. It’s only a matter of time before an ambulance crashes or brakes fail or something horrible like that. National Secretary of the National Ambulance Service Representative Association NASRA), Tony Gregg, said that the ageing fleet is definitely a concern for members. However Gregg said the problem can not simply be blamed on the National Ambulance Service, acknowledging that the money simply is not there to get the fleet up to scratch. “It’s difficult to criticise the ambulance service because it’s the government that doesn’t give it [the money] to them,” he said. - Additional reporting by Paul Hosford. Email “Paramedic: 'It’s only a matter of time before an ambulance crashes or brakes fail'”. Feedback on “Paramedic: 'It’s only a matter of time before an ambulance crashes or brakes fail'”.